When darkness falls this evening the moon, as always, appears in a more easterly location on our sky’s dome than it did the night before. The bright star near the moon tonight is Spica in the constellation Virgo. 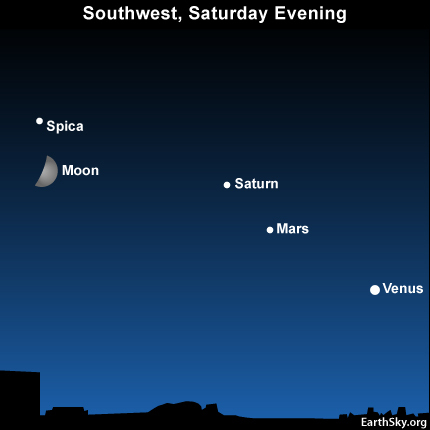 The string of lights to the right and lower right of the moon and Spica at early evening are the planets Saturn, Mars and Venus. Tonight’s moon is still at a waxing crescent, but it’s an extremely fat crescent now. The moon will be at the first quarter phase tomorrow. There is indeed a name for this demarcation. When you look at the moon in any phase other than full, you are in fact seeing portions of both the day side and night side of the moon. 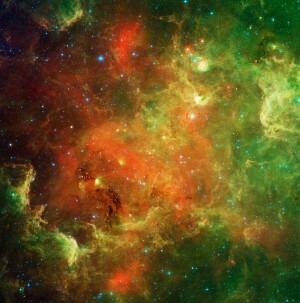 The name for this border between lunar night and day is the terminator line. If you’re using a telescope or binoculars, and want to observe features on the moon’s surface, one trick is to look along the terminator line. There, shadows are causing lunar craters and mountains to stand out in stark relief in contrast to the surrounding plains. This is, after all, the line of lunar sunrise, and in some ways it’s similar to the long shadows we see on Earth at sunrise or sunset. If you were standing at the location of that line on the moon’s surface, you’d be standing at the edge of day, or night. A similar line on Earth’s surface passes over you each day at sunset and sunrise. However, there is one important difference. On the moon, there’s no dusk or dawn, because the moon doesn’t have any air to disperse sunlight, and to create the twilight that we see on Earth. Site contents copyright © 2019 Recorder Online	except as noted. All rights reserved. | 88 queries in 2.076 seconds.